Want a side of thriller with that financial analysis? We are literally awash in non-fiction books about the current financial crisis. James Kwak and Simon Johnson, who run the excellent blog The Baseline Scenario, wrote 13 Bankers, a book that “identifies many causes of the recent financial crisis, from housing policy to minimum capital requirements for banks. The authors lay ultimate blame on a dominant deregulatory ideology and Wall Street’s corresponding political influence. Johnson, professor at the MIT Sloan School of Management, and Kwak, a former consultant for McKinsey, follow American finance’s rocky road from the debate between Jefferson and Hamilton over the first Bank of the United States through frequent friction between Big Finance and democracy to the Obama administration’s responses to the crises.” – Publisher’s Weekly review. Just from doing a little research into their backgrounds, it’s obvious each of these authors knows what they’re talking about. But, honestly, show of hands here, you don’t even have to go so far as to fill out an online poll – would you read any one of these books? Story drives everything. That was my idea when I first conceptualized my latest thriller, The Brink, which is based upon the current financial crisis. Much like Reich, Huffington, and Rajan, I wanted to educate people about America’s precarious financial situation, but I knew that people also don’t want to be nagged or preached to. Most readers would rather sit down and crack open a compelling thriller than a fairly dry textbook-like read. 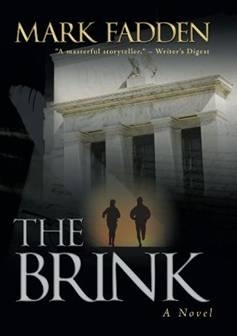 So, I used real-world numbers and real economic theories within a thriller format when I wrote The Brink, and it works. It entertains and educates. Some readers and reviewers alike have even called it, “faction” – the meeting of fact and fiction. What about you? Have you been researching something from “the real world”, maybe it’s something like global warming, that you think would make the good basis for a novel? Would you ever write a book of “faction?” Do you trust the things you read in fiction to be the truth? Or should fiction writers no try to educate? Should they just entertain and that’s it? To the keyboards! Want to start reading The Brink right now? Download the eBook version from amazon.com for less that $10 at http://www.amazon.com/The-Brink-ebook/dp/B003OYIEPC/ref=sr_1_2?ie=UTF8&m=AG56TWVU5XWC2&s=digital-text&qid=1284567122&sr=8-2 or bn.com at http://search.barnesandnoble.com/The-Brink/Mark-Fadden/e/9781450210492/?itm=1&USRI=mark+fadden. How important is book cover design? Like thrillers? Need a unique gift? 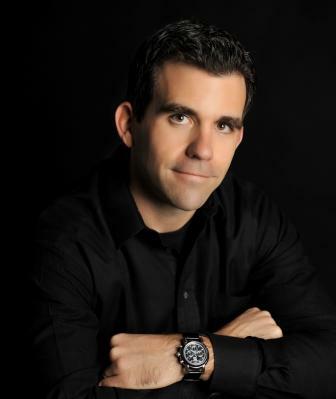 Visit Lewisville Borders Saturday, July 10, 1-3pm and get the year’s best thriller signed! I stayed with the “reading” target group and when they click on the ad, they will go to my site, but they are not taken to the home page. Rather, I’m taking them straight to the preview page where they can hopefully get immersed in the story right off the bat and then click on one of the store links at the bottom of the page to purchase the book. Tonight I must again reference the “Pimp My Novel” blog. Eric asks a great question in his blog today: Just how important is the book cover? As a publishing industry insider, he comments on everything from size of the cover to the artwork affecting how it will get show on store bookshelves. I, for one, think people can, and do judge books by their covers. Covers need to show a lot about the book, but not give away the kitchen sink. For The Brink, I wanted to show that, at its essence, it’s a story of two people running for their lives. So I’ve got the man and woman running in the center of the book. Pull back from that, and you see the shot of the Federal Reserve building in Washington, D.C. looking ominous in the shadows. There’s a reason for that, but you know why I can’t tell you. Then, if you look hard enough, you can barely make out the script from the U.S. Constitution. 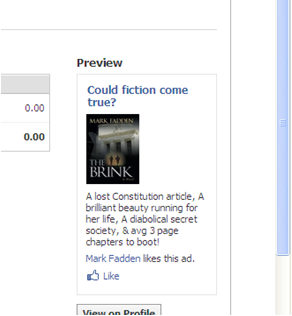 That’s there because the book starts off with a secret article of the Constitution being found, and almost stolen. Finally, the gold and silver colors of the lettering were used for a reason, those colors mean something to the plot. I was very pleased with the design folks at iUniverse. I emailed them what I wanted the cover to look like with all these elements, and they hit it out of the park. My advice is to spend A LOT of time thinking about your cover…draw it out in pencil on a piece of paper, then put it away for a few days, let the image marinate in your mind. Come back to it, make corrections, then show it to some friends you trust will give their HONEST opinion. Show it to your agent, editor, and maybe even take it to your local bookstore for a “man on the street” survey. Like Eric the novel pimp says, the cover’s gotta pop! I’ve always been interested/horrified at our country’s financial leadership, or lack thereof. I thought that one of the ways I could make people take notice of just how bad our debt situation is, was to write a thriller about it. I mean, how many people would read an economist’s 400 page thesis on the Ticking Global Financial Time Bomb? But, how many people would want to read a thriller about two people running for their lives as they try to uncover a global financial conspiracy? I’d take door #2 as well.